It’s impossible to say which one of these puppies is Freckles, but one of them certainly is. 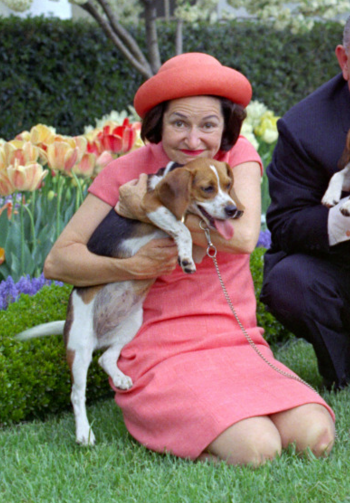 The puppies were sired by President Johnson’s beagle Him. That’s another Johnson dog, the white collie named Blanco, in the background. Courtesy LBJ Library. Jan. 5, 1966. 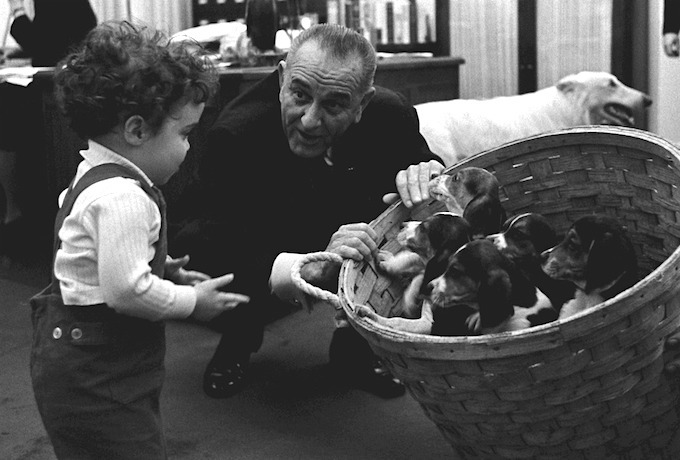 President Lyndon Johnson and his wife kept several beagles in their lifetime. The most famous were Him and Her, but the Johnsons also had Freckles — offspring of Him — and Edgar, gifted to the president when Him suddenly died. Freckles had been born in October 1965, in a litter sired by the famous beagle dad Him and a beagle mom from Texas named Brigette. She and her littermate Kim were officially given to Johnson daughter Luci. Freckles was originally called both “Pecosa” (“Freckles” in Spanish) and “Freckles” and was named by Johnson daughter Luci. As the little beagle grew, it was the name “Freckles” that stuck with her. When Luci got married and moved to Texas, Kim went with her but Freckles stayed at the White House. Why Kim was chosen to move on with Luci is unclear, but it might have something to do with her tendency to speak while the president was speaking. At a 1966 address on the South Lawn, Kim began barking and making a fuss. She didn’t stop until the president took her leash and brought her inside. Lady Bird Johnson poses with Freckles, April 1966. 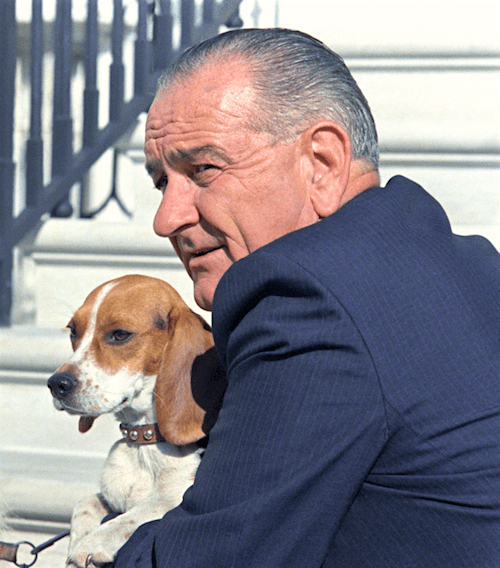 After the sudden death of Him in 1966, FBI Director J. Edgar Hoover gifted President Johnson with another beagle. Originally Johnson named the beagle J. Edgar, but in time the “J” was dropped and the beagle was simply known as Edgar. When the Johnsons left the White House at the end of their term, Freckles was adopted by a White House staff member. Meanwhile, Edgar moved with the Johnsons to their ranch in Texas. This November 1966 shows the president with either Freckles or Edgar. It was very hard to tell them apart! Freckles and Edgar had plenty of company while in the White House. Blanco, a white collie sometimes described as “weird,” was with the family during their term, as well as a lovable mutt named Yuki.